Wright & Schulte has recently filed 10 Skechers lawsuits on behalf of consumers from throughout the U.S. These cases allege that the defective design of Shape-Ups caused the plaintiffs to suffer from serious injuries, some of which resulted in irreversible damage that continues to impact their quality of life. Wright & Schulte LLC, is dedicated to helping those injured by Skechers Shape-Ups receive the compensation they deserve. Call 800-399-0795 or visit www.yourlegalhelp.com today for a free consultation! The product liability lawyers at Wright & Schulte LLC have filed 10 Skechers lawsuits on behalf of consumers nationwide who have developed debilitating injuries allegedly due to the defective design of Shape-Ups toning shoes. These Skechers lawsuits are all part of MDL 2308 and were all filed in June of this year. These Skechers lawsuits are being litigated in the U.S. District Court of the Western District of Kentucky, Louisville Division. Wright & Schulte, LLC specializes in defending the rights of those who have suffered severe injuries after using products with defective or dangerous designs. 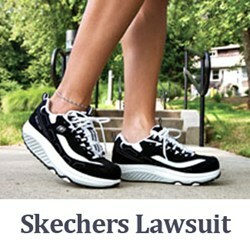 Our experienced Skechers lawsuit lawyers have a proven track record of successfully going up against large corporations. We welcome individuals who think that they have been injured due to these toning shoes to speak to our Skechers lawyers by visiting yourlegalhelp.com or by calling 1-800-399-0795. All 10 Skechers lawsuits allege that Shape-Ups advertising claimed that wearing these toning shoes could lead to various health benefits and that the plaintiffs were persuaded to buy Shape-Ups after seeing these ads. Some of the health benefits that these ads claimed Skechers Shape-Ups could provide included improved circulation and muscle tone, as well as the ability to get in shape without going to the gym. Skechers misrepresentation of the safety and effectiveness of Shape-Ups has sparked thousands of lawsuits filed against the company and has cost Skechers millions in settlement awards to consumers. In fact, in May 2013, a federal judge approved a Skechers $40 million class action settlement based on hundreds of thousands of consumer claims that Skechers intentionally misled consumers in its Shape-Ups advertising. As part of this ruling, the court also found that Skechers is no longer allowed to run ads for its toning shoes. According to court documents, the plaintiffs in these cases were allegedly wearing their toning shoes while performing their daily activities when the unstable rocker bottom of the shoe caused them to fall and severely injure some part of their bodies. Some of the plaintiffs allegedly suffered severe Skechers ankle and foot injuries. These plaintiffs include a man who tore multiple tendons in his right ankle and an woman who suffered multiple fractures in her left foot. Other plaintiffs allegedly suffered serious Skechers wrist and arm injuries. These plaintiffs include a woman who fractured her right arm and a woman who tore a ligament in and fractured her left wrist. In addition, two more plaintiffs allegedly suffered other serious Skechers injuries. These plaintiffs include a woman who herniated the discs in her neck, and a woman who tore her calf muscle and damaged her sciatic nerve. (Skechers MDL 2308). Wright & Schulte LLC, an experienced personal injury firm, is dedicated to the belief that America’s legal system should work for the people. Every day, the attorneys of Wright & Schulte LLC stand up for the rights of people who have been injured or wronged by defective drugs and their side effects, complications from defective medical devices, and unsafe consumer products. We will fight tirelessly to ensure that even the world’s most powerful corporations take responsibility for their actions. If you’re looking for a law firm that will guarantee the aggressive and personal representation you deserve, please do not hesitate to contact Wright & Schulte LLC today. Free case evaluations are available through yourlegalhelp.com or by calling 1-800-399-0795. For up to date Skechers lawsuit information follow and like us on Facebook.